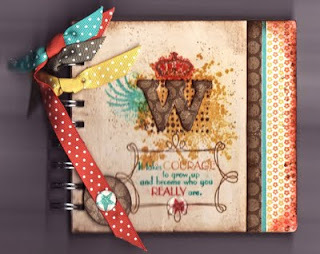 The Shabby Stamper: Goody Bag! I made this tag to go onto a goody bag. Last year, my daughter wont he CPJHSA H&H Tack Shop Equitation Medal and part of her loot was a gift from the previous years' winner. 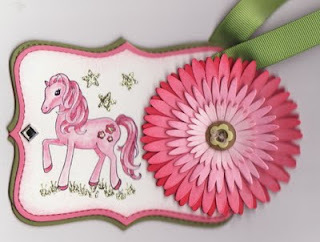 This year, we put together a goody bag of nifty things from our favorite horse show vendor, The Preppy Pink Pony. 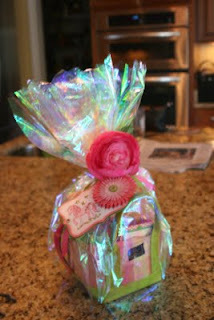 We did a pink/green/white checked Scout mini-tote filled with pink/green note cards, pink flower sticky pads with pen, rhinestone horse shoe necklace and earrings, ribbon belt with matching headband and some other little stuff. I wrapped the whole goody bag in cellophane, put on a slew of SU ribbons and a pink silk flower and attached this tag with the Old Olive ribbon. My daughter signed the back. The flower was die-cut using Flowers Daisies #2. I cut two each of each size and sponged the edges to give more depth. Two of the large flowers were attached to each other, then two of the medium and two of the small. Then the small/medium/large section were attached with dimensionals and the edges of the petals curled up. I really loved how it came out! This came out beautiful -- love the girly colors. Glad you showed a pic of the total packaged gift. Bet whoever got this was tickled "pink" (no pun intended). Love the tag, my DDs would love this. Do you want my address, lol. Your colouring is fantastic. Not my usual type of card! The first time out of the box!